Audiophile grade digital converters, low jitter clocking, and our famous XMAX preamps add up to a superior recording and listening experience. The Studio 68 operates at up to 192 kHz for ultra-high-definition mixing and recording. High-quality converters on every input and output provide 115 dB of dynamic range to capture complex musical harmonics smoothly and naturally with no audible distortion. XMAX Class A microphone preamps deliver incredibly high headroom, deep lows, smooth highs, and a rich overall sound so you’ll hear every breath, transient, and detail in your recordings, making it ideal for both vocal production and sampling. The Studio 68 is a great choice for small studios and has all the right stuff for teaching music, too! A Cue Mix A/B function lets you toggle between two mixes while monitoring through headphones perfect for both DJ-ing live and listening in on a performer’s monitor mix. Six LED meters indicate input and output levels. 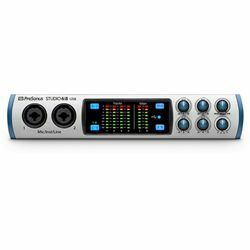 Seamlessly integrated with the included PreSonus Studio One Artist DAW, the Studio 68 interface works with virtually all Mac and Windows audio-recording software. Built by creative people for creative music production, Studio One is easy to learn and enables you to compose, record, and produce your masterpiece without getting distracted by the tools. Studio One also enjoys a robust online community of enthusiastic and helpful users you can turn to for advice. Need a new loop or sample for your latest production? Studio One lets you shop, audition, and purchase new content right from your production environment.